The Swiss Federal Office for IT, Systems & Telecommunication (FOITT) has awarded satellite connectivity provider Marlink the contract to participate in the renewal of its technical infrastructure for global data communication and deliver on-going operation of services. 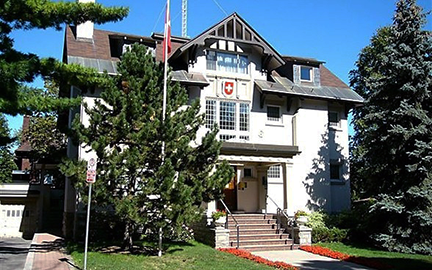 Photo of the Swiss Embassy in Ottawa, Canada. The starting point for the FOITT infrastructure upgrade is the migration of the existing VSAT installations at the embassy sites, resulting in delivery of a highly secure and cost effective technical infrastructure, with a minimum impact on existing services and users during the working period. The contract also includes provision of Carrier Class Global Layer IP VPN services via satellite-based connections, using Marlink’s state-of-the-art VSAT service as the foundation. Marlink provides flexibility, ensuring that sufficient bandwidth will be available at embassy sites in the network to ensure high availability of all data communication. Marlink will deploy Newtec Dialog technology as part of the new infrastructure, contributing to a scalable platform that will support the on-going evolution of the FOITT operations, by accommodating new technical and functional needs within the network when required. Olivier Gommes, Director Technology & Innovation - Enterprise at Marlink said that the Swiss federal administration’s confidence in their technology, satellite services and operational support confirms Marlink’s ability to provide reliable and secure solutions that meet governmental business and critical communications needs today and for the future, on a global basis.